Ok, I know – I haven’t managed to blog for a while. I don’t know how these people keep their virtual worlds going – week in, week out. It seems to me that every time I think I have the time to blog a bit, real life gets in the way and I have to postpone my virtual journey. But today is the day, it is almost a year since I first started this lovely traditional crafts road trip and I am back on the fibre optic track. Today I am in Southport to look at the Southport boat basket and before I even begin to look at the boat, which is not a boat by the way, I need to work out where I am. I have found over the course of this trip, regional traditional crafts don’t usually stick to modern county boundaries, instead they follow the geography of the land and local industry. However, as I like things nice and tidy, I usually list things under the modern county boundaries, but that was before I looked up Southport! It seems Southport hasn’t quite decided where it should be, it used to be in Lancashire and is now in Merseyside, but many people who live there would like to move back to Lancashire. Anyway I am not to discuss local county boundaries, I am here to look at local baskets. I found out about the Southport boat through a friend of mine, Greta Bertram, who works at the Museum of English Rural Life. We had been discussing Historypin and Greta wrote a great post on their blog, A Sense of Place about how Historypin was evolving and she mentioned the Southport boat within her post. So I absolutely had to trot off to Southport to go and find the basket. This basket has proved rather elusive. It is known locally and amongst basket makers, but there is very little information out there about it. The first thing I did find out was it doesn’t come from Southport at all but from a small village nearby called Mawdesley, which incidentally is still in Lancashire. It is said the name Mawdesley originated way back, when a certain Matilda-Mawde married a local lad and the town was named after her as part of her dowry. The Mawdesley family were the local ‘lord of the manor’ type and have lived in Mawdesley Hall, built by William Mawdesley in 1625, pretty much ever since. Over time the town became famous for its basket making and the baskets were known for their strength, mainly due to local growing conditions which resulted in nice strong willow. By 1862 there were eleven basket making businesses in the village and this rose to twenty in 1874. Even the Mawdesley family established themselves as basket manufacturers and ran one of the larger businesses at Towngate Basket Works which remained open until the 1960’s. The industry supported many people, some working full time and some working at home to supplies the frames of the basket lids. Plus, there were many farmers who grew the willow, dependant on the industry too. In 1914 there were 200 acres of willow around about the village and all those twigs had to be cut by hand and then sorted, dried and peeled. The local industries mean there was no shortage of demand for the baskets. Supplies were made for coal mining, shipping, fishing, agriculture and mills. 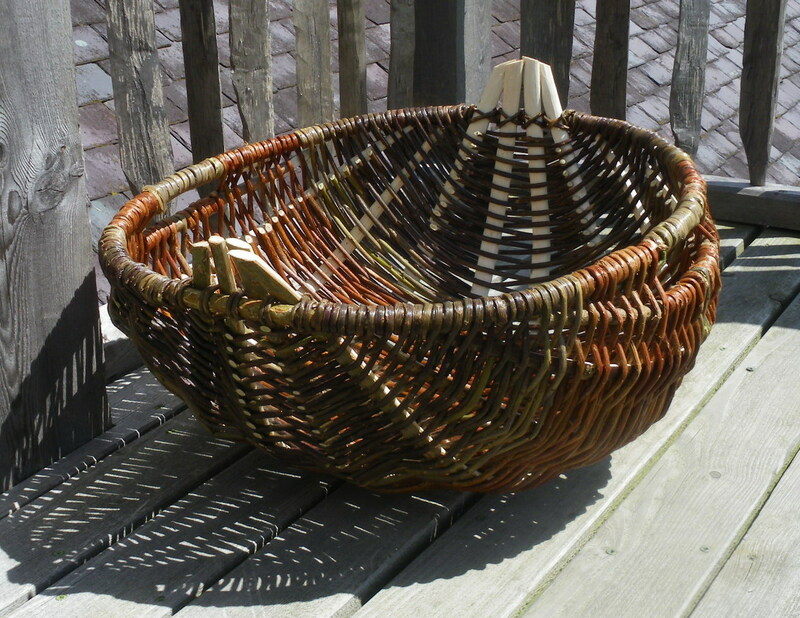 So, the Southport boat was one of many baskets made in the basket making village of Mawdesley. What made the basket special was that the design can be put down to one man, Mr Cobham of Mawdesley, who reportedly came up with the design in 1830. 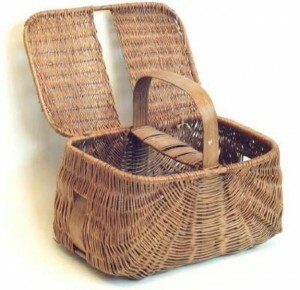 The boat basket was invented to carry eggs and butter to Southport market and the design combined the Morecombe Bay cockle basket and other gipsy baskets. Once Mr Cobham had come up with the design, the manufacture was developed by Thomas Cowley, who owned a local basketmaking firm and then adopted by other basket making firms. However, I tentatively suggest it is more probable that Mr Cobham actually refined and commercialised existing traditional baskets rather than actually invented a new one. I say this as the development of the Southport boat is similar to the Sussex trug and although not familiar with the Southport boat, I know in great detail how people in Sussex dispute whether the trug was invented or whether it was ‘refined’ from earlier spale baskets. I would love to know more if anyone can add to the Southport boat story, please let me know! Whatever its origins, the Southport boat was a very successful design and was soon made by many basket makers. The boat is a type of frame basket (a basket made around a frame, rather than self supporting). It’s rim and handle are made from hoops of split ash and it has ribs which fan out, radiating from the handle. 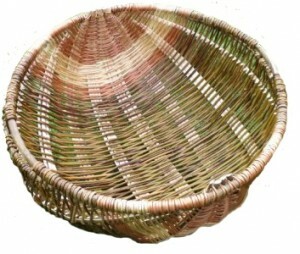 These ribs are not attached to the rim but added as the basket is woven. Interestingly, like the Welsh Cyntell basket, the Southport boat is woven from the top down as opposed to bottom up, as most baskets are. 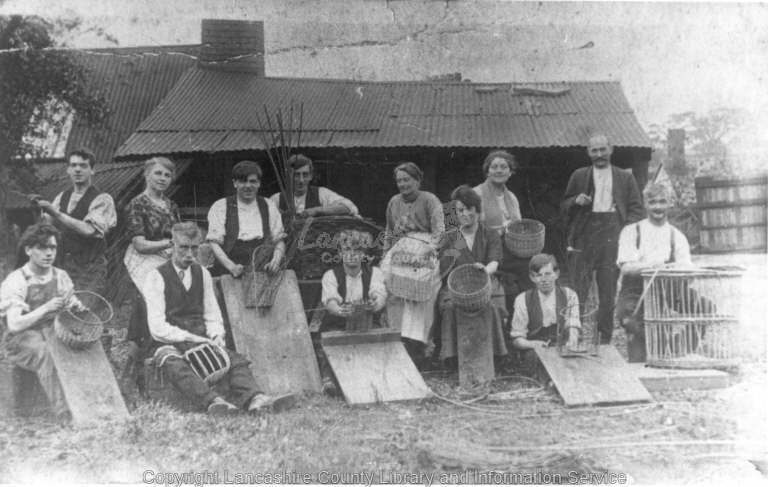 The basket making industry in Mawdesley began to decline, like many other traditional crafts, during the twentieth century due to all to familiar reasons; the migration of workers to the cotton mills and rubber works, the invention of plastic, cheap imports and the effect the over extraction of water and river pollution had on the osier beds. Nowadays, although the shape of the Southport boat will be very familiar to many people, I have not been able to find any basket makers which list the basket as one of their products. So please, please – if you know of anyone who still makes Southport boats then get in touch so I can list their details in this post – thank you very much. 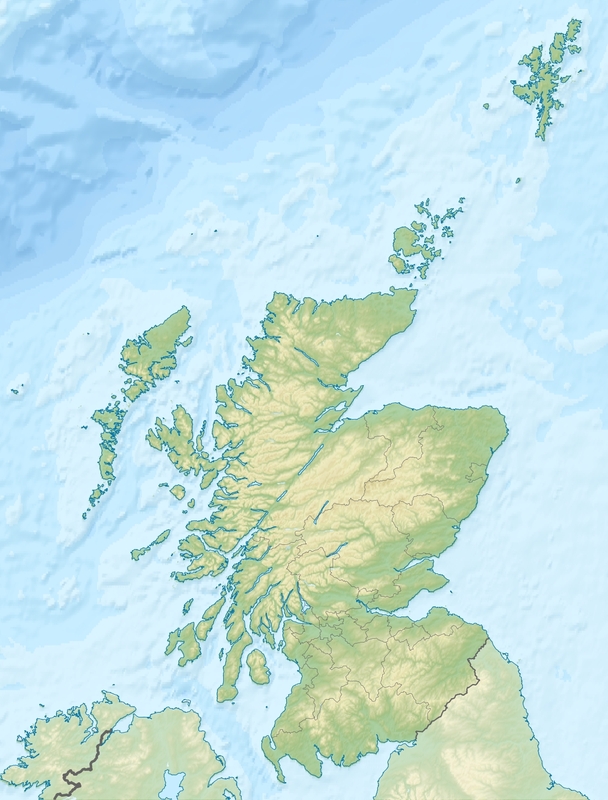 For those who don’t know, the Orkney Islands are a series of about seventy islands which are just off the north east coast of Scotland, only sixteen of them are inhabited and it is to here I am journeying today in my virtual jaunt around British Isles. The islands lie in the path of the Gulf Stream and so enjoy a climate milder than would be expected so far north. Being a very flat series of islands they are a tad windy, to say the least, and for this reason the islands are almost totally treeless. Life in the Orkney Islands has always been mainly based around traditional crofting system of farming, which is a system of subsistence farming common in Scotland. The Orkney Chair has evolved over time as a response to its locality and it is a really good example of how regional craft objects represent the culture, geography and social and economic history of an area. 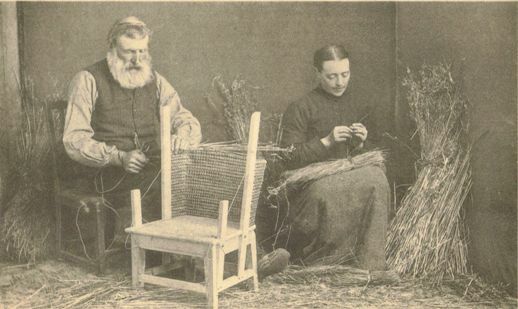 Like many other regional crafts it is impossible to pinpoint when Orkney chairs were first made, but it is possible to chart how they evolved from simple stools to the full blown chair associated with the islands today. 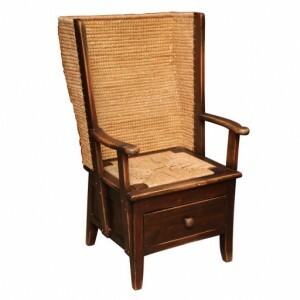 Way back when, Orkney chairs were no more than stools and made almost entirely of straw, only the feet of the chair were wooden. Now, this was because wood was in scarce supply on an island where there were no indigenous trees and it was sensible to make your furniture from material freely available locally and there was plenty of left over straw from the Black Oats, grown to feed the livestock. This straw was used to make all manner of household items, not only on the Orkney Islands but in many rural areas across the country. Referred to as lip work the straw was coiled into baskets (known as cubbies and lubbies on the Orkney Islands), twisted in rope known (simmens), formed into mats and used to create beds. As time went by people began to use driftwood, often from ship wrecks, to form the base of the chair, yet it was still no more than a stool covered in straw. It will never be known who first had the bright idea of adding a low woven straw back, but someone, at some stage, got fed up of crouching on his stool and updated the design to include a back about two feet tall. The chair was still kept low so people were able to sit close to the ground and avoid the smoke from the open fires burning in the centre of the room. Later still people began to add hoods to the chairs to keep out the draughts and sometimes added a drawer under the seat. Apparently this was for the man of the house to keep his ‘things’. (This makes me wonder if the man in my house has Orkney roots as we currently have four ‘man drawers’ full of ‘man things’). So the Orkney Chair evolved into chair fit for purpose, it is the perfect shape to keep the heat in and the draughts out and used throughout the centuries to provide a comfy seat. They were made very upright though as nobody just sat they would be sewing, spinning, whittling or doing something. 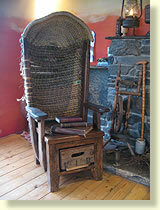 Of course nothing ever stays the same and in the 1890s there was a bit of a shake up in the Orkney chair world. Up until this point the traditional Orkney chair had been made for use by the maker’s own family or to be sold within a small local market, but in the late 1880′s things started to change. Firstly, in the later half of the the 1800′s the Arts and Crafts movement had gained in popularity both in England and Scotland and there was an increase in interest in hand made crafts as opposed to factory goods. In 1889 The Scottish Home Industries Association was founded by the Countess of Rosebery. Its aim was to promote and ensure a fair payment of, household crafts in Scotland. 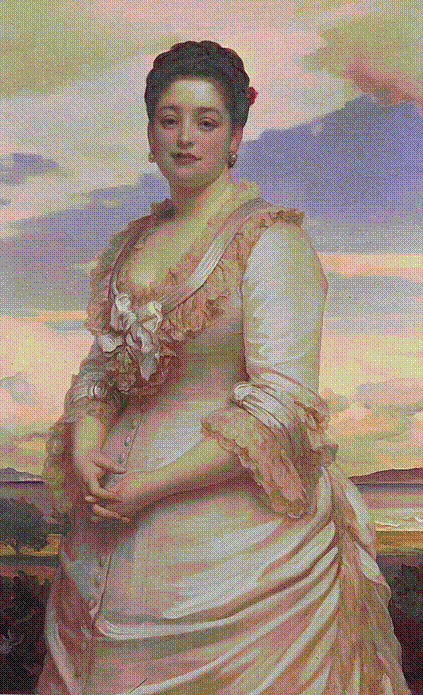 It was probable she was influenced by the Arts and Crafts movement, which was well established in Scotland. 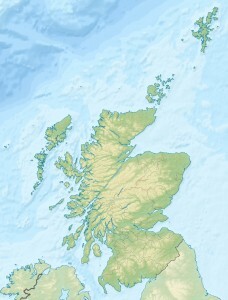 The Association took the traditional crafts of Scotland and sold them to the great and the good ‘down south’. 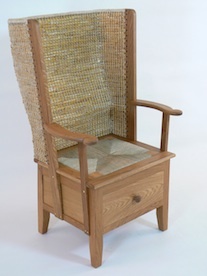 Concurrently, or maybe as a result of this, a Mr David Kirkness, a joiner of Kirkwall, began to produce four standardised versions of the traditional Orkney chair. By doing standard versions he was able to increase his output. The straw backs were all stitched by outworkers, often fishermen and farmers who stitched in the evenings, or whenever they could. It is estimated he made about 400 chairs per year, far more than other makers. This new publicity and increased output meant Orkney Chairs became a must have item for the upper classes, Liberty’s of London stocked them, Queen Victoria had one and apparently even the Queen Mother was very keen to and had some too. This definitely helped the long time survival of a vernacular design classic and Orkney Chairs are still very much in production today. One very important feature, which has remained unchanged throughout, is the way in which the Orkney chair is constructed. Locally grown straw is used to make the backs which still have to be stitched by hand. The chair frames, originally made from driftwood, are now more often made from the best quality wood available and beautifully finished by hand. It is interesting that the chairs are still evolving. 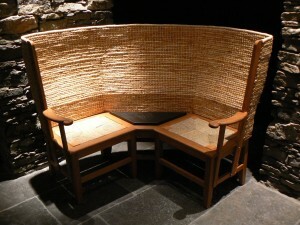 Benches are now made as well as rocking Orkney chairs and fan backed chairs, all of which reflect a modern phenomena we are able to enjoy in this country – just sitting and relaxing! I am going over the border today, to a country where traditional culture and language has been fiercely defended for years. I am slightly wary as to where to start on this as I could easily emigrate and spend all my time just writing about Welsh stuff; blankets, baskets, love spoons, clogs etc. But as I have to start somewhere I shall start with the cyntell basket (I believe ‘ll‘ in Welsh is pronouned ‘th‘ so it would be ‘cynteth‘ – but please correct me if I am wrong). The cyntell is a multi functional basket used around the farm to ‘carry stuff’; animal feed, potatoes and fruit and they can also be utilised around the home, for laundry and sleeping babies amongst other things. I also wonder if they were ever used, way back when, as a unit of measure like the trug in Sussex. In fact, like the Sussex trug and the Cumbrian swill, the traditional frame basket was not confined to county or country borders. Known as a cyntell in Ceredigion and Carmarthenshire, identical baskets were found across other regions and over in Ireland, where they were known as skibs, scuttles and Sally Saucers. The cyntell is formed around a thick, dried willow or hazel hoop, with split and shaped wooden ribs, which together form the frame which is interwoven with willow. The original farm baskets would have been rustic affairs but a tradition developed to weave more elaborate competition baskets and these are what are more common now. The survival of the cyntell is said to be down to three men, D.J Davies, Marvin Morgan and Les Llewelyn. In the late 1990′s they were all working at St Fagans National History Museum in Cardiff. Mr Davis was the basket maker, Mr Morgan the miller and Mr Llewelyn whittled love spoons and walking sticks. Mr Davies had been the resident basket maker at St Fagans since it opened in 1948, demonstrating the weaving of cyntell basket as taught to him by his farmer grandfather (who had been taught by his father, no doubt). Aware that Mr Davies was one of the only craftspeople still making the traditional basket, Mr Llewelyn and Mr Mogan decided to ask Mr Davies to pass on his basketry skills. As Mr Davies had begun to think he would be the last basketmaker in Wales to make the cyntell basket, he was delighted to pass on the skills which had been passed through the generations, via his grandfather. Having gained the necessary skills to call themselves basket makers, the two younger men set about keeping the traditional Welsh basket making skills alive and kicking. Mr Davies and Mr Llewelyn became founder members of The South Wales Basketmakers and Mr Davies also became President of the South Wales Stickmakers group. I believe Mr Morgan became the resident basket maker at St Fagan’s after Mr Davies retired, but unfortunately, when I searched St Fagan’s website I could find no reference to either cyntells or Mr Morgan. Luckily for us, many people now seem to appreciate the relevance of craft items associated with particular regions. 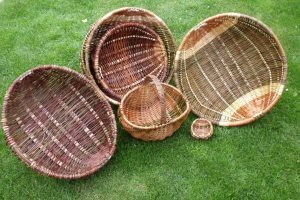 The South Wales Basket Makers Group holds regular courses to teach others the essential cyntell skills, with Les Llewellyn running many of these. It seems the knowledge passed on from Mr Davies is now safe in the hands of keen basket makers in Wales and beyond. Indeed, it could be said (at a stretch) that cyntell basket making is a growth industry and let’s be honest – there is not many of those about these days!! 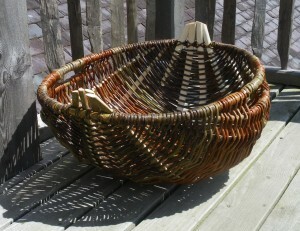 Links through to makers who produce cyntells and also to cyntell making basket courses for interested people. Owen Jones – Owen also learnt to weave cyntells from DJ Davies and runs the occasional course to.